Jojo Moyes does it again. 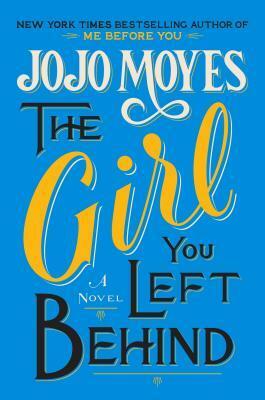 The Girl You Left Behind is another heartrending tale that moves briskly to a compelling conclusion. The writing is twisty and vibrant. It's the kind of story that keeps surprising you. The only thing I didn't exactly buy into was Liv's obsession with the painting. There didn't seen to be a legitimate reason for her to be so gangbusters about it. It was essential to the story that she wanted to keep that piece of art but it kept snagging on my brain as unrealistic. I found the history in this book to be fantastic. I was even quite a fan of the romantic elements. That's not something you'll hear very often from this reader. Have you read The Girl You Left Behind? I'd love to hear your thoughts in the comments below. I'm also not a romance fan, but I'm glad you mentioned the historic element - I think that this sounds great, Jennifer. I have Sarah's Key on my kindle, and really want to read it, so I guess I will start there since I have that book. Maybe I will purchase this one too! I enjoyed reading your thoughts. I enjoyed this story. You make a good point about Liv's obsession with the painting. Thanks Pat :) There was just something about her obsession that didn't ring true. I downloaded this book to Sparky a couple of weeks ago...and loved Me Before You, so I can't wait to dive in. Thanks for your great review! I disagree with you because I can't stand Liv. How dare she think that a stolen painting is hers to keep? If you purchased a stolen car, you wouldn't be in trouble, but you can't keep the car. Why would Liv think she can keep the painting? It's immoral to me. Although, I did read the end, so I know what happens but that's the kind of thing that bugged me like crazy. Exactly! That's basically what I said...I just didn't buy why she thought she should be able to keep the painting. It didn't ring true to me at all. Ha ha! Nope, it made me crazy. It was pretty see through as a plot device. Jennifer, I'm with you on Liv -- I keep considering DNFing this one, but I think I'll finish it to review tomorrow. I SERIOUSLY need to work on reading some JoJo. But everyone loves her and her books so much that I'm slightly afraid that I'll be disappointed. Read it. Loved it! My first Moyes novel but definitely not my last! I especially loved Sophie's story and the history surrounding it. One of my favorites of the year for sure! Jojo Moyes is my new go-to comfort/romance author. I just love how well-rounded her stories are. So glad to hear you enjoyed this one! This might be one to check out from the library Ellie ;) See how it goes? I enjoyed the historical parts but thought first part a bit too long. I understood Liv better because it's all she had left. Agree a somewhat over the top reaction. While I loved it, it's not better then Me Before You. I think we're going to agree to disagree Anita, lol. I'm pretty sure I liked this one a bit better than Me Before You, ha! I am really looking forward to reading this one! You make it sound so good, Jennifer. I hope you really enjoy it!! I recently won a copy of this and I'm really excited to read it. Though I enjoy her writing, I was a little frustrated by a few things with Me Before You. I think the historical fiction aspect of this is more to my liking. I love how you describe things... "twisty and vibrant"? That totally intrigues me! I loved this one. It makes me happy to hear that you enjoyed the romantic elements, because you're so discerning... There were a couple times when reading this where I was like "SERIOUSLY, LIV? Just give them the painting!!!" Because that was a little crazy, but then I was all happy with the way things wrapped up so I stopped being a grump about it. You are twisty and vibrant... And I mean that in the best possible way! More often than not romance makes me say ICK. ;) Twisty and vibrant, ha! I'll take it! 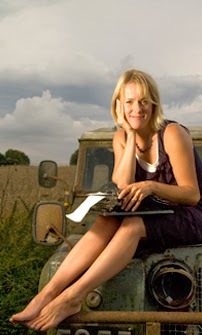 I have to give Jojo Moyes a try sometime soon! Everybody seems to love her books. I brought her Me Before You twice but couldn't read it both times. She's incredibly popular :) I think her work speaks to a lot of people. There's romance but it's not your typical unbelievable romance..that's my fave thing about her books. Great review! I loved this book and am looking forward to reading Me Before You soon. I agree with your point that Liv's obsession was a little hard to take. You should try The Last Letter From Your Lover- her first novel. Love hearing that the historical facts are solid and enjoyed. And not too heavy on the romance. Sounds like a really good read. Have you read The Soldier's Wife by Margaret Leroy? Set in WWII on Guernsey, it too is a story of a soldier at war whose wife is quickly approached and pursued by a German soldier. Perhaps a bit more romance than this sounds, but a 5-star read from my perspective. You might enjoy. I'm on page 60 or so and I just love the vibrant detail. There's detail like in The Historian and then there's Jojo Moyes AWESOME, eat-it-up detail in this book. So good! Absolutely, absolutely agree with you about this one. I had a problem, too, with the obsession about the painting and I didn't entirely buy into the solution but I was willing to get over all of that because I enjoyed both of the stories so much. I agree with you completely :) I enjoyed this and couldn't put it down, but the obsession with painting did seem a bit over the top to me. Yes, yes, yes. Great minds ;) Right? Right~!